Wash the plums, then halve and stone them. Mix together with the sugar and cinnamon and tip into a pie dish with about 3 tablespoons of water. 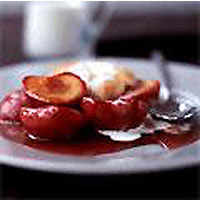 If you're adding fresh damsons, either halve and stone them, or lightly cook them in the 3 tablespoons of water, fishing out the stones before mixing them into the plums. Put the fruit in the oven for 15-20 minutes to begin cooking while you make the cobbler topping. Sift the flour and salt into a bowl. Rub in the butter until the mixture resembles fine crumbs. Stir in the sugar. Beat the egg and add the milk. Pour this into the flour and thoroughly mix with a fork until it forms a lumpy dough. Transfer to a floured surface and lightly knead until smooth. Quickly roll out to just under 1cm thickness, then stamp out discs using a 6cm floured pastry cutter. Arrange these, barely overlapping, on top of the fruit. Brush with milk and scatter with some granulated sugar. Place the cobbler in the middle part of the oven and bake for 15 minutes. Then reduce the temperature to 190°C/gas 5 and bake for a further 10 minutes. This is best served warm but is still very good eaten hot or cold.